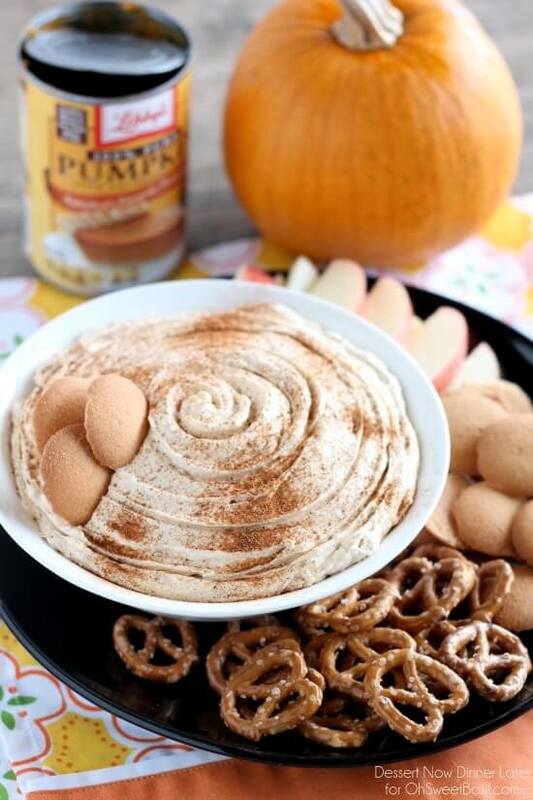 This Pumpkin Cheesecake Dip is one everyone can enjoy with their favorite cookie, pretzel, or fruit! Plus, it’s no-bake so it’s easy! Hi friends! It’s Amber, from Dessert Now, Dinner Later! I’m back to share another great recipe with you all! Things need to slow down because I am enjoying fall and I know winter will be here in Utah sooner than I like to admit! Today’s recipe is fall and pumpkin inspired. I’m not ready to give up the pumpkin recipes yet! They’re good through Thanksgiving anyways, right?! Good! This pumpkin recipe, is much less traditional in my mind because I am always BAKING with pumpkin, but this Pumpkin Cheesecake Dip is a no-bake delightful treat! Can Dogs Eat Pumpkin Cheesecake Dip? There’s no need to panic if your dog has eaten some of your pumpkin cheesecake dip, but don’t intentionally feed it to your dog. While pumpkin can actually be good for dogs, Cheesecake is a no-no. For one, it’s a cheesecake, it contains cheese! Cheese, though, is a dairy product, and as most dogs are lactose intolerant, they cannot properly digest dairy products. If your dog is lactose intolerant, then feeding him cheesecake will only cause him intestinal distress (excessive gas, diarrhea or vomiting). For two, cheesecake contains a lot of sugar! Sugar can make your dog act hyper, and cause health problems such as dental cavities, diabetes and obesity. It’s definitely not a good idea to feed your dog sugary treats. How to Store Leftover Dessert Dip ? 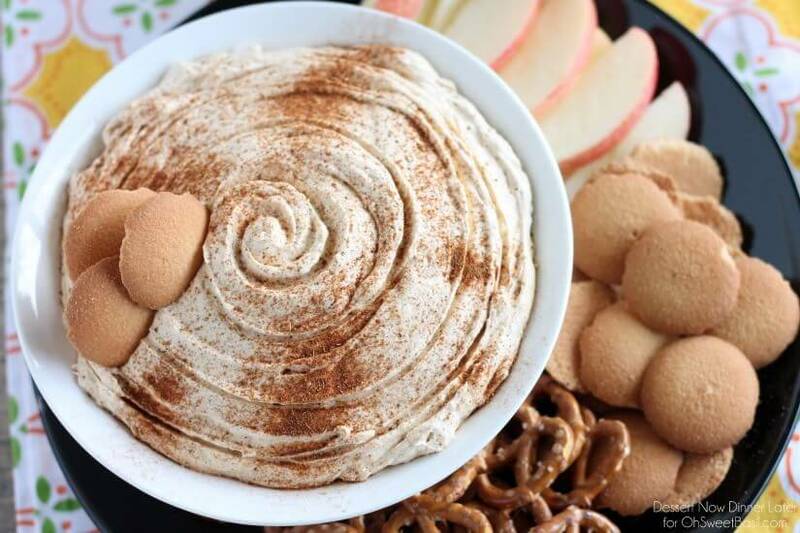 Cream cheese dessert dip is so good, but it can start to separate being stored in the fridge. So how do you store leftover dessert dip? You may be surprised but a ziploc bag is the best way to store your dip as it allows you to press out all of the air, but it’s also a hassle to get out the next day, so the next best thing is a bowl and plastic wrap pressed into the top. You can use Tupperware as well, but just be aware that it doesn’t completely seal it so moisture can cause separation. 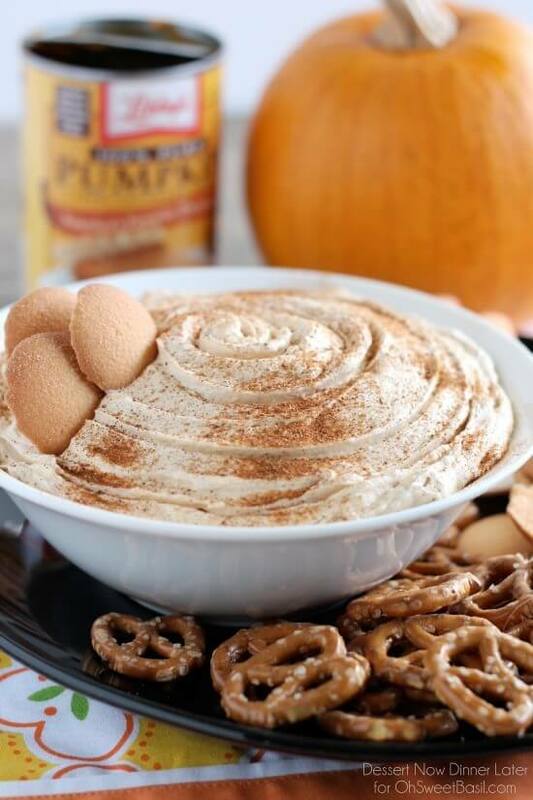 I think this Pumpkin Cheesecake Dip would work well as a no bake cheesecake in a graham cracker pie crust as well. Really, it’s so versatile and delicious! If you have a party coming up and need something easy to bring, make this! You’ll be glad you did! 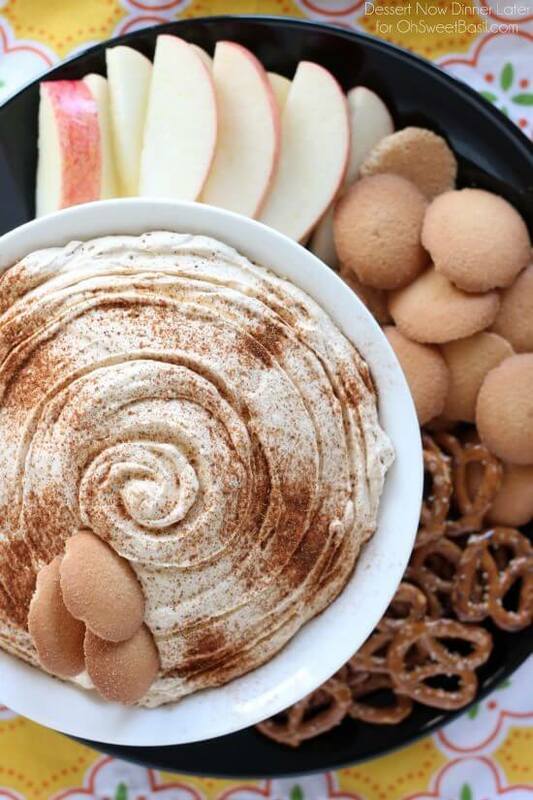 Ok, I love this dip, but let’s all get it out there, the question everyone wants answered, what to serve with pumpkin cheesecake dip. It’s really up to you what to serve with this dessert dip, but for me, I prefer to keep things really simple. We generally use graham crackers, Nilla wafers, or Lorna Doone cookies, but this year we discovered my new favorites, Ginger Snaps or Biscoff Cookies. So good!!! Of course you could always take the healthier way, apple slices or bananas, but I’ll stick with cookies. 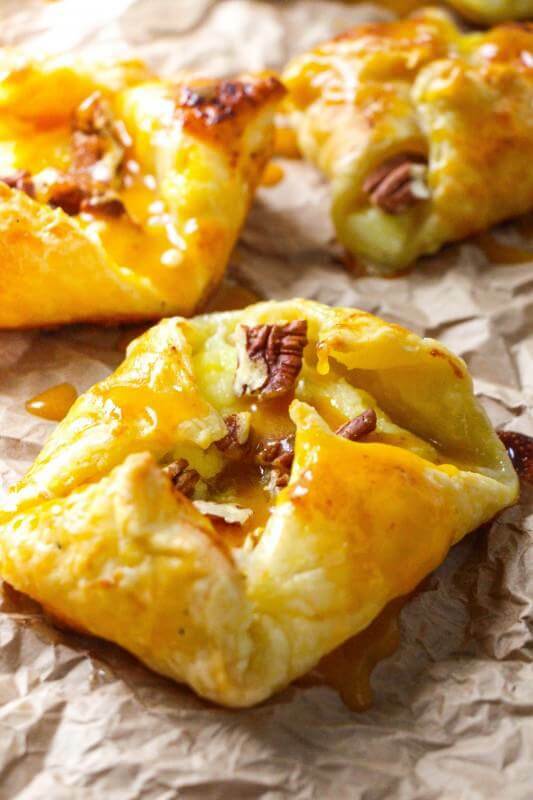 These Easy Pumpkin Praline Danishes are a beautiful and easy way to impress guests! 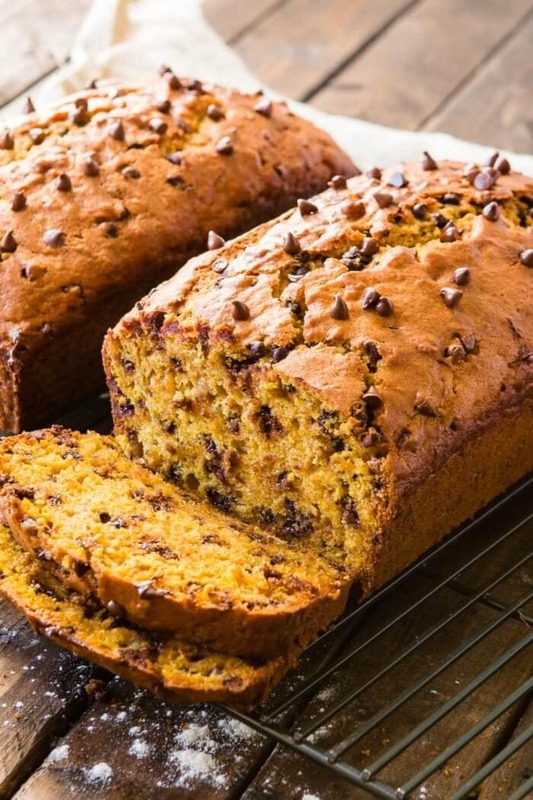 Our Pumpkin Banana Bread is filled with chocolate chips and tastes just like fall! With a handheld mixer and large bowl, beat the cream cheese with the powdered sugar until smooth. Mix in the pumpkin puree and pie spice. Beat in the cool whip until mixed thoroughly and the beaters leave ripples in the dip. Optional: Top with a sprinkle of cinnamon or pumpkin pie spice. Serve with apples, pretzels, vanilla wafers or your favorite dippers.